There was a recent article on Cleveland.com that provided 10 Vitamix blending tips with head Vitamix recipe chef, Bev Shaffer. Some of the tips discussed were important so we wanted to share these with our readers. For those that don’t know Bev, she is one of the most well-known recipe chefs in the food industry. We have had the opportunity to meet her and were not only impressed with her ability to create incredible recipes, but were even more impressed with her down to earth demeanor. Here are the 10 tips Bev offered during her interview with Cleveland.com. Layering ingredients is crucial: Liquids should be added first, then smaller and softer items, then heavier, hard, and larger items. Frozen ingredients should be added last. Water in the bottom helps: If the recipe permits, water or watery liquid like orange juice, broth, or cherry juice lifts many ingredients off the blades so they have a better chance of being blended. The Vitamix is loud: These machines are powerful. Don’t be surprised by the noise of the blender’s impressive motor. Use the tamper: When things aren’t blending or appear to be stuck, use the tamper to mix things up. Don’t worry, the tamper is designed not to touch the blades when being used. Only use high-speed at certain times: Most Vitamix machines have three buttons – one to turn it on and off, one for variable speeds, one for high-speed. For efficiency in many recipes, you want all ingredients to be moving before you hit the high-speed button. Use seasonings sparingly: According to Shaffer, when seasonings are cut with a Vitamix blender, their oils are spread more thoroughly and quickly through the Vitamix. This is true not just for spices, but also for onion and garlic. Clean machine promptly: Clean the container right after you use it with one drop of dish detergent. The container is not meant to go into the dishwasher and cleans best immediately after using. In order to clean, rinse immediately with cold water fill halfway with water, add the detergent drop and run one minute. We created a video that shows how easy it is to clean a Vitamix blender. You can easily make flour: Use the Vitamix to make flour pay for the cost of whole rice (Or wheat, or oats, etc.). Vitamix also sells a dry-grains container with a specific blade for improved blending. Chop vegetables finely: For some vegetables, a Vitamix can replace the food processor. This machine is hard to break: If your machine stops, doesn’t mean it’s broken. Vitamix blenders have a safety mechanism that prevent it from overheating. 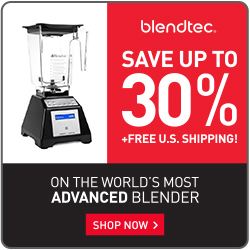 BlendtotheEnd.com has partnered with Vitamix and any link clicked on this page will automatically apply a promotion code, which gives you free shipping on any machine. If you decide to order via the phone, provide the customer service rep the promo code “06-009709″ to receive free shipping. Visit our Vitamix Promotion page if you have any issues applying the free shipping discount. Below is a list of all of the different Vitamix blender series along with some information about each product line. Vitamix has a product comparison page that has some of the information listed below. What tips have you learned from using your Vitamix? Please share any and all tips and tricks for making the most of a Vitamix blender! If you have any questions, comments, or suggestions for BlendToTheEnd.com, please contact us!